In addressing the challenges and concerns of the UK’s print industry, it’s important to remember over 8,600 companies employ over 122,000 individuals and enjoy a gross annual turnover of £13.5 billion. The UK market is the fifth largest producer of printed materials in the world. It’s a powerful player and it will survive the significant challenges facing the industry at present. There has been a critical decline in the publishing print division (magazines, books, reference books, catalogues and newspapers) due to the “new media” explosion (social media, eBooks). Road maps have been replaced by sat navs and smartphone apps. Search engines have superseded reference materials and books, marketing budgets are focused on and committed to email advertising and websites. 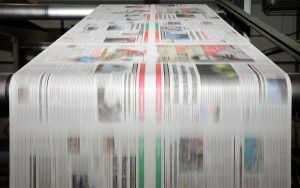 These digital commodities have replaced printed materials and the publication print sector is set to decline an average of 3.7% over the next five years. In comparison to other developed European countries, the UK economy has been rather stable. So far, an immediate post-Brexit financial fallout has not occurred. It’s expected that any downturn will concentrate on already stressed sectors such as graphics and publication products. By 2019 it’s expected that just 5% of marketing budgets will be dedicated to physically printed material, due of course to more profitable marketing opportunities emerging from social media and mobile devices. While sector turnover has been comparatively stable, the print industry has shown a downturn in the number of employees and companies. There are two elements driving this decline, one a past influence and one a contemporary factor. The fallout from the 2008 recession such as decreased profit margins meant that not all print industry companies survived. By 2012 this situation had stabilised and print industry incomes began to climb. Secondly, advances in automation and production processes have caused a reduction in the overall numbers of employees. The development of improved production processes mentioned earlier comprises fixed capital investment. Demand has changed direction, from sheet-fed litho to digital, and this is expected to carry on. As a result, companies are choosing the growing digital print market over high volume long run requisitions. Interestingly, cut sheet continues to dominate twice the current market share of digital print. It’s expected that crude oil prices will continue to climb, which means the already higher cost of raw materials such as carbon black (10% increase in 2016), hydrocarbon resins (5%) and mineral oils (20%). Drastic shortages of sulphate-based TiO2 due to the Finland Huntsman fire and China’s new production restrictions will receive full analysis and projections in the coming months. Hanjin Shipping’s bankruptcy has further compounded the pressure, as has the increase in transfer times from China and India, as well as cancellation and reduction of routes. Print industry companies need to consider their supply chain and manage the challenges accordingly. The majority of the challenges facing the print industry emanate from the consequences of industry development and evolution. Overall, print companies across the industry are doing the right thing: adapting and developing their products in line with new markets and consumer demand. The future is bright. Athena use the most innovative recruitment techniques including automated 24/7/365 systems and 20 years’ expertise in retained Executive Search. Enter your email address in the field below to begin download.